Day 24, only one day left. 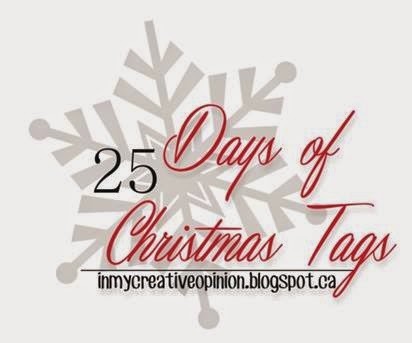 Keep loading your tags into the 25 Days of Christmas Tags Flickr Group, fabulous inspiration over there! As we move through the 25 days you have a new opportunity to enter for the prize draw every single day! The main prize draw HERE has five opportunities for you to enter and all the other days from Day 2 on you have one opportunity a day. You also have an opportunity every day to visit my guests and comment on their blog posts for yet another chance. As long as you enter on or before November 27th 11:59 pm EST and follow the entry guidelines. I enlarged the photo of my tag today so that you could see the texture--embossed snowflakes, Glossy Accents on the goggles and a Stickles pom pom. By adding some of these subtle textures it creates interest to a CAS design without adding bulk. Did you notice that another prize from Paper Sweeties has appeared? For a chance to win one of all the the prizes I have, leave me a comment telling me what you love about snowmen. Thank you to all the crew at the Card Concept for joining me today as my guests and check out The Card Concept to see the details of our next challenge. Don't forget to comment on all of the designers blogs for another chance to win! Seriously...every day outdoes the prior...amazing days of inspiration Tracey. Love your sweet little snowman's chevron scarf. I love all of these snowmen!! So cute!!! 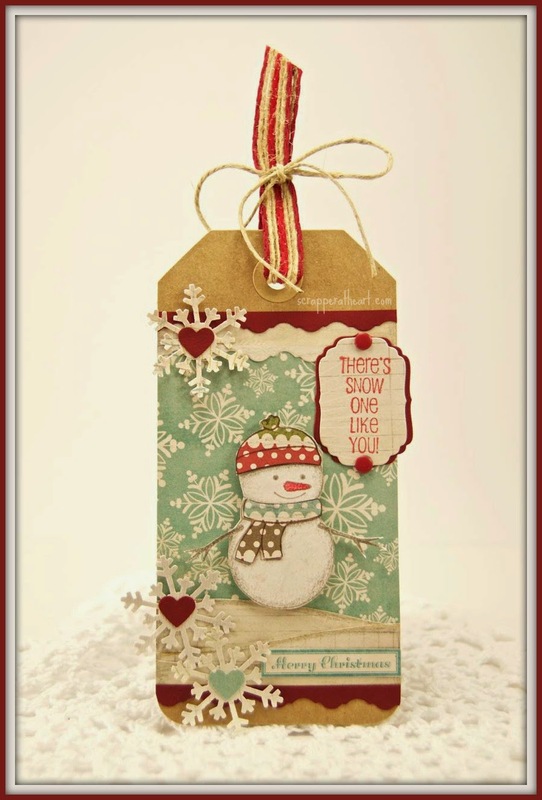 As for your tag Tracey, your snowman is ADORABLE with his glassy goggles & sparkly pom pom, LOVE the texture of the embossed snowflakes too - THANK YOU for the INSPIRATION!!! ... 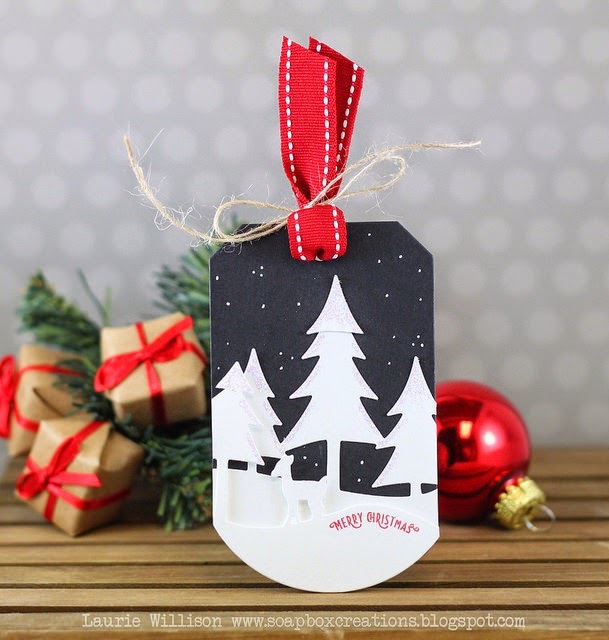 I confess that heat embossing is still a bit of a challenge for me, hoping to improve over the coming weeks so that I can make the tags & cards that my mind is planning for Christmas this year. As for your question today, I've only seen snow & snowmen a couple of times in my life, but I always associate them with FUN TIMES and how could anyone not want their very own Frosty or Olaf? The tags just seem to get more and more amazing! Snowmen are adorable, but I prefer to enjoy them from the warmth of my home! Those goggles are awesome!! So clever. Snowmen just mean children and laughter in the snow!! All these tags are so stinkin' adorable!!!!!! I love snowman!! 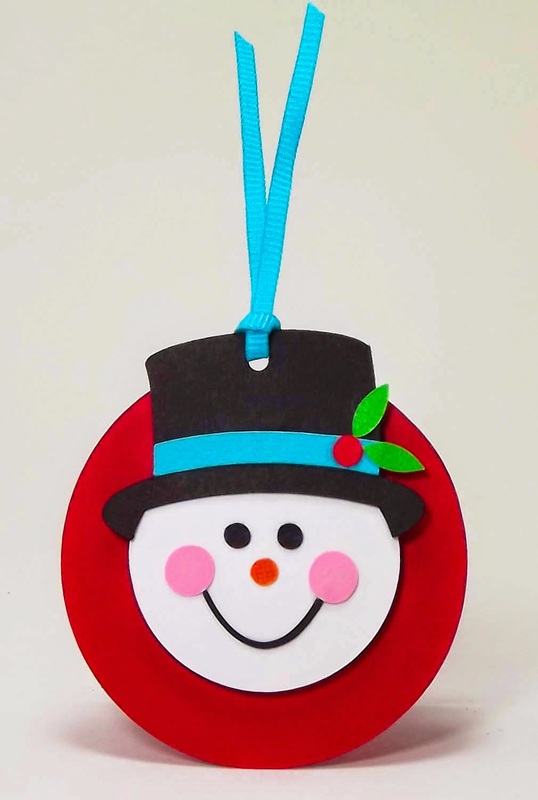 They are fun to make with your kids and grandchildren and finding little things like a hat or piece of material for the scarf can be just as fun for the snowman!!! Okay those goggles KILL ME! Awesome job..
ACK! Such adorable tags from everyone today! And I love your cool snowman, Tracey! What's not to love about a cute, cuddly snowman! So many cute tags. Tracey, I love his goggles! 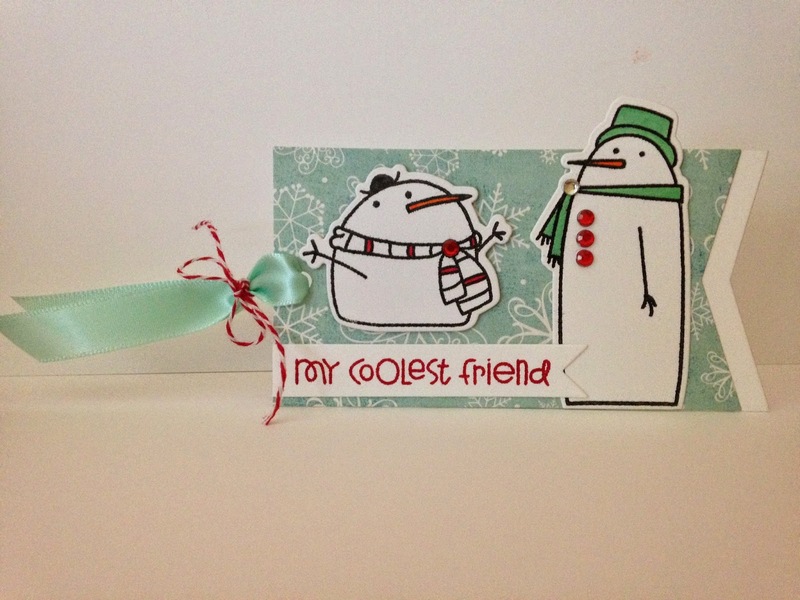 Oh Tracey your be-goggled snowman is so CUTE! 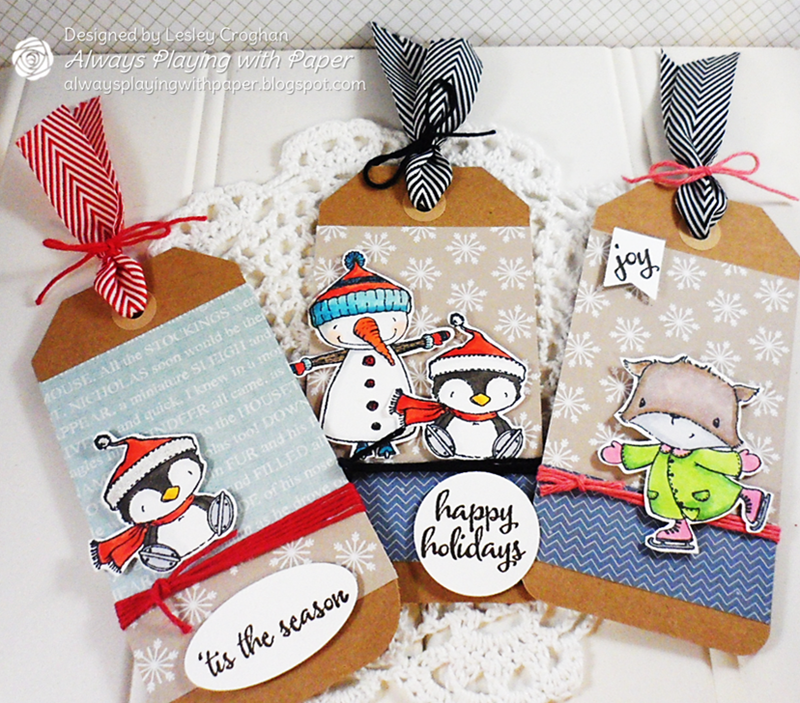 Love the glossy lenses :) What a wonderful set of snowman tags from this crew, so much inspiration! I'm amazed at the variety of snowmen from you and the inspiring team. Fabulous projects! What I love about snowmen: they're always smiling! So many gorgeous tags today! I love all the different shapes! Great texture on your tag - the goggles look fabulous! What do I love about snowmen? What's not to love? They are cute and they make me smile! I think I've always loved snowmen since I was a child when I made them in the snow. I must confess I haven't made one for many years, only on my cards! 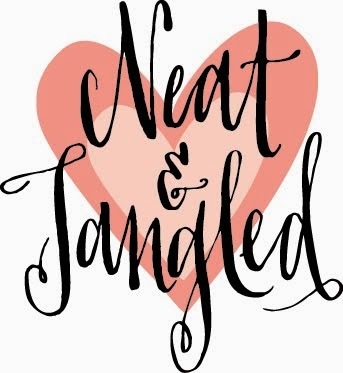 Love all these tags, and how fun you have a new prize. I love snowmen because I can leave those decorations up all winter and don't have to take them down right after Christmas. We also love making colorful snowmen outside. We build a snowman and then fill squirt bottle with colored water and my son has a blast squirting the snowman with all the colors. 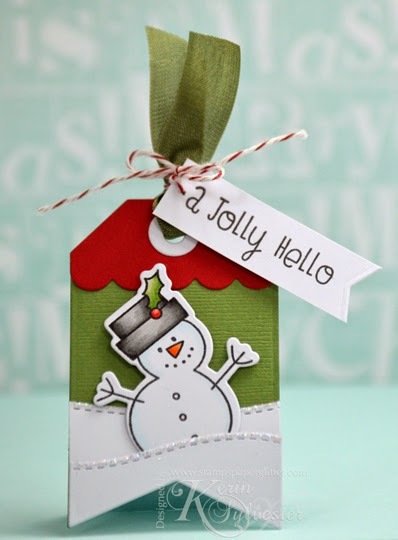 Love your darling snowman tag! 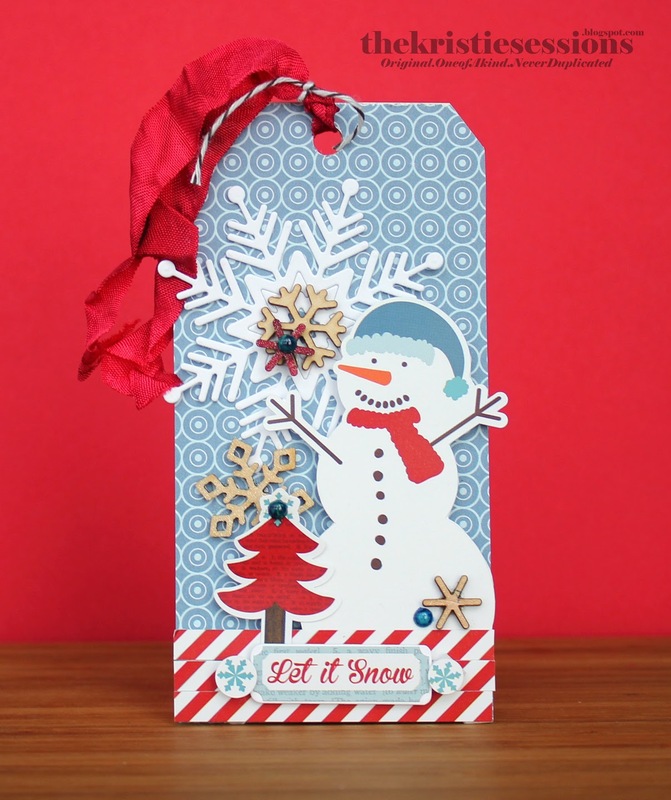 Pretty color background and fun little snowflakes embossed in white! I have been partial to snowmen for years... 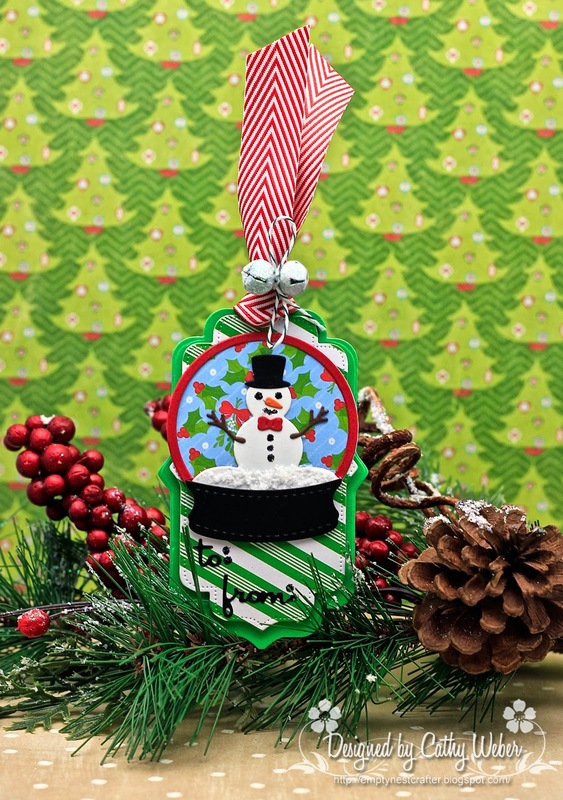 I collect snowman ornaments and pick out a special new one every year to add to my tree! Something about them is simply charming! Wow, amazing collection of tags by the designers! Your goggled snowman cracks me up, so fun! Snowmen are just fun little dudes that make me happy. I always wear my sunglasses when I'm outside so I can relate to this guy. I think snowmen are fun because they can be so many different things - from people to animals to whatever comes out of your imagination. they make people happy. So many adorable snowmen today! I love snowmen because how can you look at one and not smile? They are so soft and cuddly. Adorable skiiing snowman. I love that you can make unique and different snowmen any way you want. Bwahahaha! The goggles crack me up! Once again, you have totally out-done yourself, Tracey! I love how you added texture to your tag...so cute, and those goggles just crack me up! What I love about Snowmen, is that we can dress them up in whatever we like...it makes them fun! I can't believe there is only one more day...I'm going to miss this series! Love the goggles on the snowman! So "cool"! Those googles are awesome; the perfect complement to your adorable snowman! I thoroughly enjoyed the plethora of snowman inspiration shared today. Inspired and inspiring...again!! Well that is an amazing collection of snowman tags! I love the ski goggles on your tag, Tracey! Ha! :) What I love about snowmen is actually building them with my kids...so many fun memories made that way! That we had so much fun when it snowed. I feel like today's post was just for me!! I just love love snowmen! 90% of my Christmas decorations are snowmen. They each have a cuteness and unique face which always makes me smile. I love snowmen because they are round and fluffy...sort of like me!! These tags today are AMAZING!! How cute to put goggles on your snowman - love it!!! I love everything about snowmen! I love building them - out of stamps AND snow!!! LOVE this perfectly sweet display of snowman tags today!!! And those goggles...you rock!! Tracey...such a fun treat to get to play along with you again! I love all the wonderful cool inspiration today...and all those fabulous snowmen too. So many cuties in this bunch. I love Geri's traditional old snowman. For me, Frosty is THE snowman. And a snowman means it actually snowed, which doesn't happen here enough! 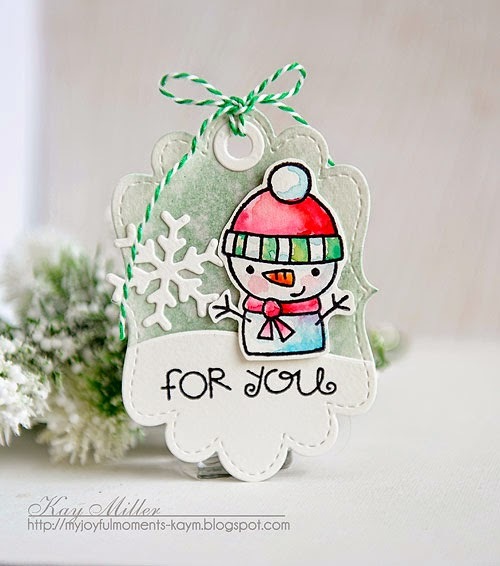 oh my loving all the snowmen.. such cute tags.. thanks for sharing..
WOW, lots of awesome tags! Tracey, your snowman hiding behind it's glossy goggles is perfect. Snowmen melt my heart. Each one has its own personality - in real life and with paper. Hope to get some more hopping and commenting before tomorrow night. Ohhhhhhhhhhh these are fabulous! Snowmen are just FUN!!! Just like the flake, no two are alike!!!!! love all these!!! and I am such a huge snowman girl!!!! LOVE when you actually get to build one in the snow too. Tracey, you are so talented tag maker!!! Wow, Wow, WOW!!! and I love all of these snowmen!! So cute!!! Your snowman is super cool ....he looks so retro!!! Nice job!! Wow! Loving all the snowmen today! 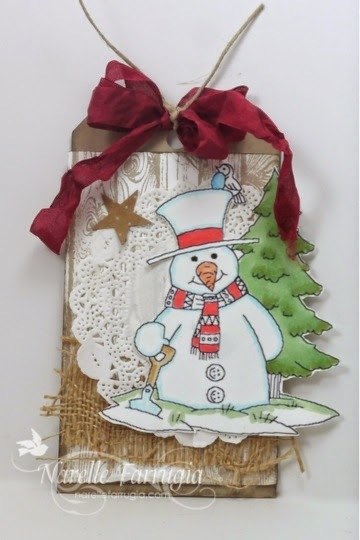 You created such a wonderful background with the embossing and the love the patterned paper for his scarf! I love that no two snowmen are alike, just like snowflakes! Thanks so much for sharing! Now I want to build a snowman! I have enjoyed all these days of tags. 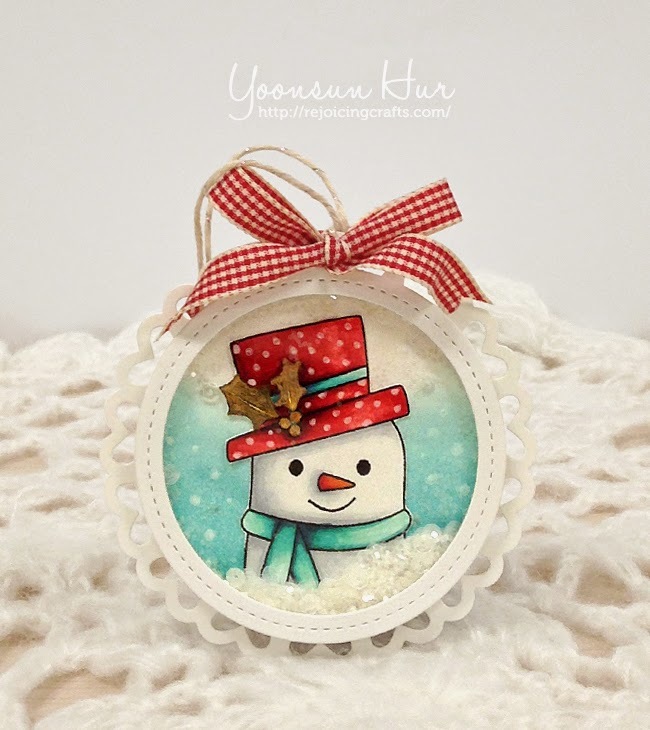 Snowmen are fun to make and make snowy winter days a delight. Hello Tracey! Your tags have blown me away lately!!! Your talent is immeasurable! I love snowmen because they remind me of the innocence only found in the children who believe in them! What a cool snowman. Love its 3d goggles. Cool heat embossing too. I have only built one snow-person in my whole life but I made it into a snow woman. It was fun. Everytime I see a snowman I think of that time. That's why I like snow people. love the ski goggles! lol! Oh so many cute snowmen! I love making snowmen because it means quality and fun with friends and family. As for snowmen images...there are so many cute images out there, and they are ALL so unique and cute! I love the carrot noses and the twig arms on snowmen. Thanks for having us, Tracey! I commented this morning but blogger must have eaten it! Love your sweet snowman and his goggles! Awesome inspiration from the team too! Hugs my dear friend. I love all these tags. I'm having so much fun with this! I hopped and hopped then hopped some more ... thought I would drop by to say how lovely it was to visit each of The Card Concept designer's blogs and learn more about their fabulous tags :) It took me a little longer than I expected but was well worth the journey - THANK YOU ALL!!! Tracey, those goggles...crackin' me up! LOVE your tag! your tag is adorable, love that snowman! Cuteness!! Your tag withy he snowman n glasses is incredible ! Your Tag is so cute,Tracey!! I love the cute snowman!! snowmen are just so cute and happy! 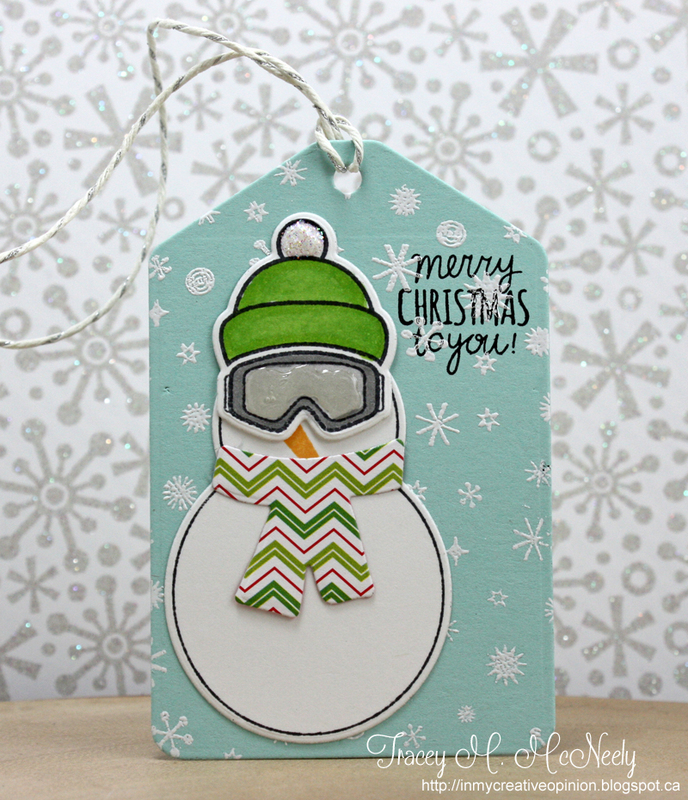 What spectacular tags and love your snowman with his cool goggles!! I've never built a snowman, only been in snow once. I think they are such a symbol of Xmas, even though we have Xmas in Summer. They are always happy, never seen a grumpy one ever!! So many fabulous tags. I know you are probably just worn out, but I am sad that this program is ending, because I have had the most fun getting inspired by a new group every day. What a treat for me. Way too hard to pick one favorite today. They all have so much cuteness. 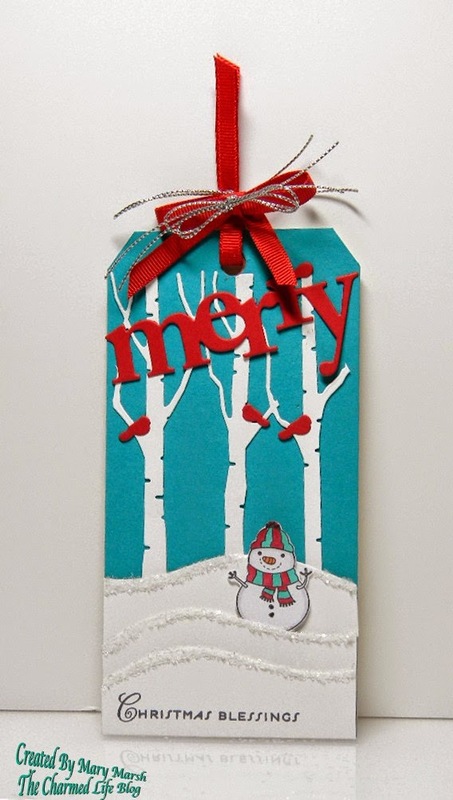 I especially love Mary Marsh's tag with those snowy trees against the blue sky and all the red highlights!